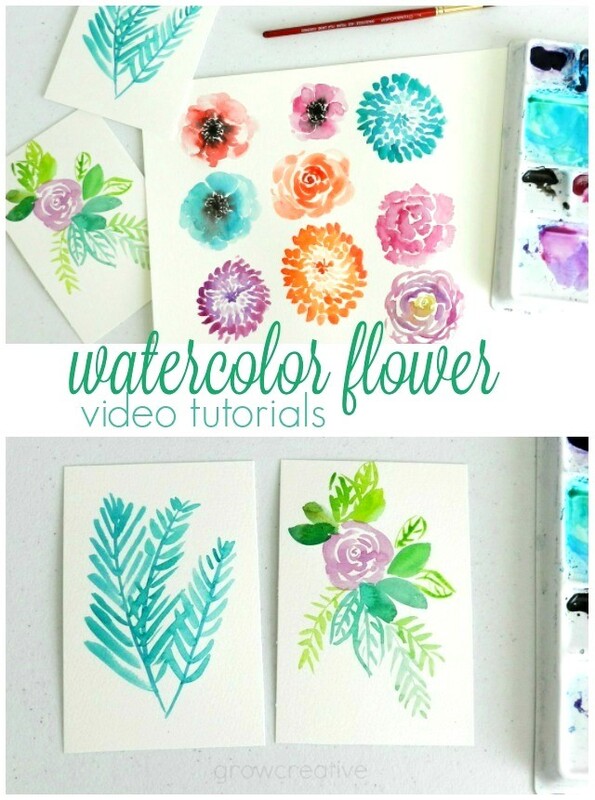 The day has arrived to share some watercolor videos! Today I'm sharing three different flowers. In a couple days I'll share the rest. These are short videos only showing my hands as they paint. I didn't talk or explain anything in these videos because I think I sound weird on recordings (maybe one day I'll get over that). But, I'll offer a few of my flower-painting-tips in this post! These are semi-abstract flowers. They aren't super detailed or realistic. I really like this style because it keeps them from being overworked. They look fresh and fluid. The key with these flowers is to keep your paint wet. You don't want harsh lines with layers. I know this is not the traditional method of applying watercolor paint, but it's a method I've come to love! Anytime you see a gradient of dark to light within a flower petal, I've first applied a bit of heavy pigment, then washed out my brush a bit, swiped it on my handy paper towel to get some water off, and then gone back and let spread out some of the previously applied pigment. Or I just let the lighter, more watery paint mix with the heavier darker paint. If I find that one area needs a little more darkening, I add that extra paint on top while still wet so that it blends fluidly. This is probably the opposite of what you've been taught on how to watercolor, but it still works. It's all about water and pigment control. Too much paint on your brush can leave too much on your paper. Too much water on your brush can thin the paint out and leave your painting looking pale. Keep lots of paper towels with you to blot your brush as needed. It may take a bit of practice to get this method down. It took me a few years to really loosen up my painting style, but don't be discouraged by that! That's why I'm posting these videos. These would have helped me enormously when I started out. I had to figure this out the old fashioned way, trial-and-error. Let me know what you think about these videos and if you give these flowers a try! Love these videos! Beautiful flowers. Thanks so much for sharing! Elise, it's very lovely! The quality is good, and everything is nicely done! Thank you so much! I also really like the music in anemone's video. Who is the author? Thanks for watching my videos Olga. The music I used is just some free stock music from google. Loved the videos. Im an absolute beginner and even I will be giving these a try so thanks. These were exactly what I was looking for! I am just beginning to use watercolors, and I love the loose florals I see others painting. I was hoping to do some of those myself. Thank you! You're welcome! I'm glad they are a help to you. Good luck with your painting! Beautiful! Have you painted on fabrics? No, I've never tried fabric painting, but it sounds fun!